Claude Hendrix may be one of the most important figures in early Wrigley Field history. He started the very first game played in the ballpark (as a member of the Chi Feds), and the very first game the Cubs played there. On the other hand, his career ended with a gigantic asterisk. Team president Bill Veeck got a telegram before a game in August of 1920, saying that there had been an unusual amount of betting against the Cubs. The starting pitcher that day, Claude Hendrix, reportedly bet $5000 himself. The Cubs didn’t let him start the game. Grover Cleveland Alexander started instead (and was offered a $500 bonus if he won the game)—but the Cubs still lost 3-0. Though he had no proof it was true, Veeck ruled that the spitballer Hendrix couldn’t play for the Cubs the rest of the season. (History fails to note that Hendrix was running out of gas at the time anyway). Veeck also reported the incident to Judge Kennesaw Landis. In Judge Landis’ autobiography, he admitted that he quietly banned Hendrix for life. No public announcements were made. While Hendrix suffered greatly for his role in this case, he didn’t suffer as badly as the team across town. The investigation into this game didn’t turn up anything against Hendrix, but it did turn up a much bigger scandal: The Chicago White Sox had fixed the 1919 World Series. The Sox were acquitted in court, but banned for life by baseball anyway. Unlike Hendrix, they will forever be branded as the most notorious cheaters in baseball history. Roy was on the same pitching staff as Claude Hendrix. He started and relieved for the pennant winning 1918 Cubs, although he didn’t see any action in postseason. 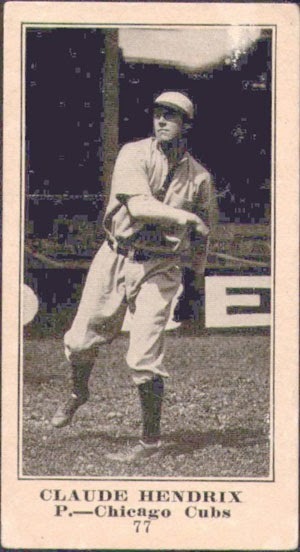 Walker probably had his best season in the big leagues with the Cardinals in 1921, when he won 11 games. He also pitched for Cleveland. Strange was a backup infielder for the Cubs for two seasons, and hit under .200 in about one hundred at bats. Still, Doug managed to have a nine-year big league career. He also played for the Tigers, Mariners, Expos and Pirates. When you’re a decent defensive catcher, they’ll find a place for you in the majors. Stephenson was Randy Hundley’s backup for two seasons, which means that he didn’t get a lot of playing time. He also served as a backup catcher for the Mets, Giants, and Angels in a ten year big league career. One of his claims to fame: making the final out in Jim Bunning’s perfect game in 1964. He actually pitched pretty well as a swingman. He won 6 games 1940, with a 2.92 ERA, and 8 games in 1941, with a 3.35 ERA. He also saved 6 games for the Cubs during his time with them. He went to the Tigers after his Cubs stint. His final season in the big leagues was 1944.